Barred owls are among many species of birds that nest in the cavities of trees. It finally happened. Recent gales toppled a long-dead balsam onto my garage. It also knocked a rail off the deck but did little other damage. I knew it would happen sooner or later. I should have taken that tree down 20 years ago. But I couldn’t. The birds loved it. This particular tree stood closest to my bird feeders. It was a favorite landing spot for birds making one last safety check before swooping in to grab a sunflower seed. Chickadees, nuthatches, goldfinches, woodpeckers and blue jays frequented its dead limbs. In fact, the tree almost always had birds perching on it. The squirrels would leap onto it when startled off the porch. I will surely miss that dead tree. I did take down a second tree that was leaning ominously toward the garage. It’s best to do this chore in autumn when there is no chance of birds nesting in it. To birds, trees are wanted: dead or alive. Many birds are cavity nesters. In local backyards, woodpeckers, nuthatches and chickadees nest in holes. Tufted titmice and house wrens nest in cavities. Bluebirds and tree swallows do it. Great-crested flycatchers do it. Even bigger birds nest in cavities. Wood ducks do it. Common and hooded mergansers do it. 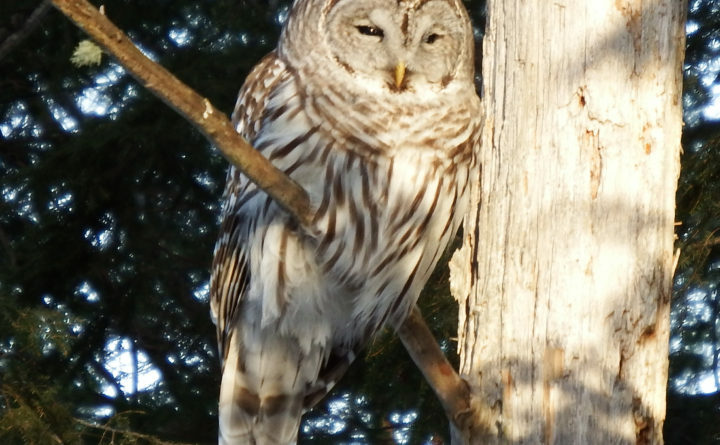 Saw-whet and barred owls do it. So do American kestrels. Warblers don’t do it. For reasons only they understand, none of our eastern warblers nest in cavities. Nationwide, there are just two exceptions: the prothonotary warbler of the Mid-Atlantic states and Lucy’s warbler out west. Common goldeneyes do it. In fact, a couple of years ago, I was driving the Golden Road not far from Ripogenus Gorge when I saw a duck fly head-first into a power pole. High tension lines run along the West Branch of the Penobscot River to the site of the former mill in Millinocket. The hole was 50 feet up in one of these wooden poles and was probably created by a northern flicker. Flickers like to nest higher than most woodpeckers. I was astonished. How often do you see a duck enter a pole? Furthermore, how does a duck fly full speed into a cavity that is barely her own size? Cavities are so important to some birds that they will nest in holes where there aren’t even trees. The saguaro cactus is a favorite nest site for several species of desert woodpeckers. Once they’ve finished with the hole, elf owls, pygmy owls, swallows, sparrows and finches take over. 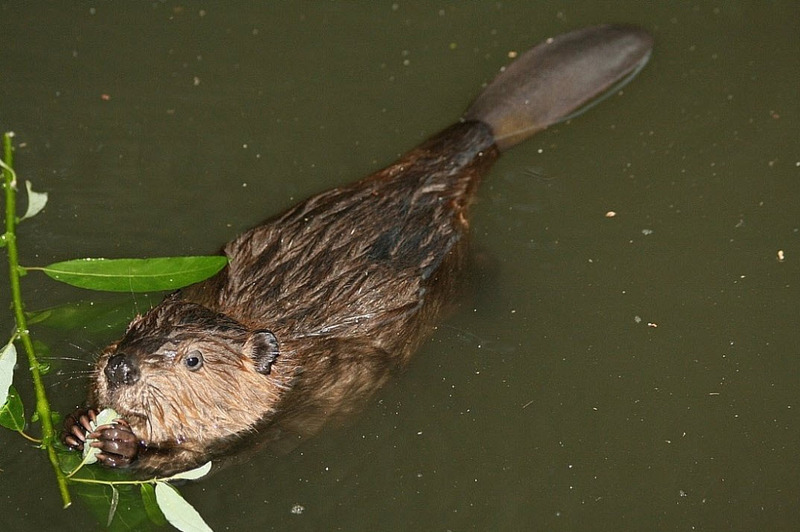 Altogether, about 85 North American species nest in cavities. That represents about 13 percent of all breeding species on the continent. Woodpeckers drill most of these holes, usually making new ones each year. Other species then take over the old ones. Some birds are capable of shaping the old holes to their own advantage. The name “nuthatch” comes from the Old English word for hatchet. Nuthatches often do a little excavating of their own to improve existing cavities. Woodpeckers are perfectly happy to drill holes in live trees, but a dead or dying tree with a soft center is much easier to excavate. Some holes develop naturally, without woodpecker help. Where boughs break off a live tree, weather and external rot can turn a knothole into a cavity. Whole limbs can split from the trunk, opening a cavity big enough for ducks and owls. A healthy ecosystem needs unhealthy trees. It was once customary to remove dead trees from woodlots, fearing that they would attract insect pests and disease. Then the birds disappeared. With no birds around to eat the insects, infestations got worse. The United States Forest Service realized their mistake about 50 years ago and established a policy to protect cavity trees. In fact, foresters were advised to survey healthy trees, pick out snags that were likely to be useful after death and leave them upright. Federal foresters now set targets for how many dead trees remain standing, spread throughout a well-managed forest. Orchard owners followed suit. Previous practice called for pruning dead limbs and treating knotholes to prevent rot. Bluebirds melted away. Other cavity-nesters, including tree swallows and non-native species such as starlings and house sparrows, aggressively challenged the more passive bluebirds for available nest holes. After arborists improved pruning practices and erected birdhouses, bluebirds returned to Maine orchards and fields, though not to historical levels. The mid-October winds may have knocked over my favorite tree, but those gusts did some good, too. They blew away a lot of political campaign signs. Bob Duchesne serves as vice president of Maine Audubon’s Penobscot Valley Chapter. He developed the Maine Birding Trail, with information at mainebirdingtrail.com. He can be reached at duchesne@midmaine.com.